The Deep Sea Minerals Project is a collaboration between the Pacific Community (SPC) and the European Union (EU). Initiated in 2011, the €4.4 million DSM Project is helping Pacific Island countries to improve the governance and management of their deep-sea minerals resources in accordance with international law, with particular attention to the protection of the marine environment and securing equitable financial arrangements for Pacific Island countries and their people. The DSM Project has 15 member Pacific Island Countries: the Cook Islands, Federated States of Micronesia, Fiji, Kiribati, Marshall Islands, Nauru, Niue, Palau, Papua New Guinea, Samoa, Solomon Islands, Timor Leste, Tonga, Tuvalu and Vanuatu. The Project is also working to encourage and support participatory decision-making in the governance and management of national deep sea minerals resources. Despite the rapidly growing commercial interest in deep sea minerals many Pacific nations do not have the necessary legal or management systems needed to ensure the responsible management of these important natural resources. 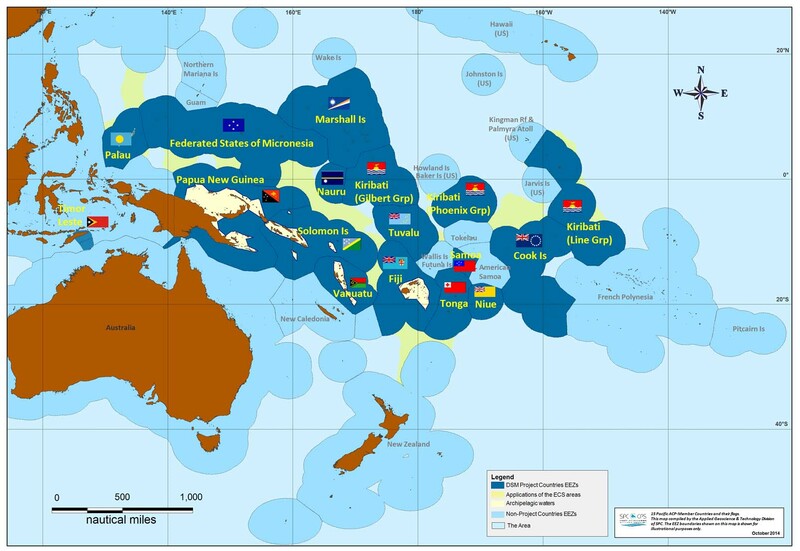 In response to this urgent need Pacific Island countries requested the development of a regional project to help governments develop the national frameworks and technical capacity needed to strengthen the management of their national deep sea mineral resources. In August 2012 the Project launched a Regional Legislative and Regulatory Framework (RLRF) to help countries to develop the national frameworks needed to improve the management of their marine mineral resources. 5. Review national policies and legislation to be submitted to cabinet for enactment. The Project will help countries to build needed capacity among national technical professionals in the areas of marine minerals, policy development, fiscal and taxation regimes and environmental monitoring. The Project will assist countries to develop monitoring systems for deep-sea mining operations.